[By Nick, New for 2014, Discontinued] With brands like TCBY invading the freezer aisle, it was only a matter of time before others such as Baskin-Robbins followed suit. “But wait Nick, you could already buy pre-packaged Baskin-Robbins products.” Why yes, you’re correct. You can buy their products from one of their stores but what if you’re someone like me who doesn’t have a Baskin-Robbins within a 50 mile radius? (That’s the furthest their website would let me search. I’m pretty sure I don’t have one within 100 miles of me.) 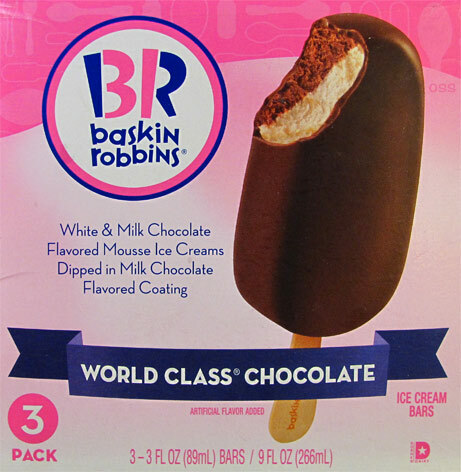 Well thanks to the folks at Boardwalk Frozen Treats, you can now purchase Baskin-Robbins bars and faux-pints from your local grocery store! While not in stores around me just yet, they were kind enough to send me a sample pack of both lines. Since I got the complete catalog of bars, let’s take a look at those first! There are three bars in total: Jamoca, Mint and World Class Chocolate. While the base flavors are obviously different, the first two use a dark chocolate flavored shell while the world class chocolate uses a milk chocolate shell. Let's start this review with the dark ones. The dark chocolate shell isn’t all that dark to be honest. The flavor is actually quite weak overall. Outside of the color, I’d be hard pressed to identify it as dark over any other type of chocolate. 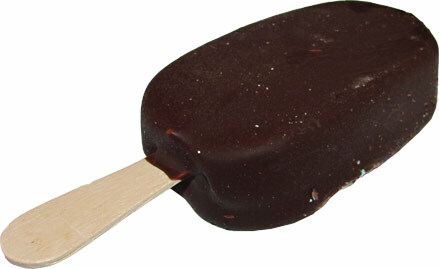 The flavor of the chocolate shell is irrelevant however because both ice creams overpower it when eaten as a whole. This works for the Jamoca bar but not so much for the Mint. On the other hand, the Mint bars don’t fair all too well. 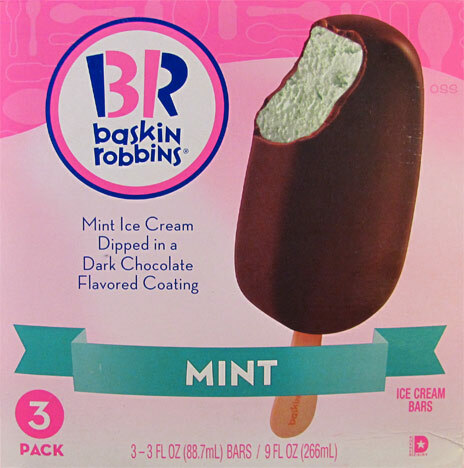 First off, the mint ice cream is reaching the territory of toothpaste and while that can be saved by the addition of chocolate, there’s just none of that going on. I don’t think I’ve ever experienced a time when I questioned if chocolate was even involved. It adds a crunch so there’s that but if I was blinded folded I’d think it was a mint shell or something like that. There’s not even chocolate mixed in to the ice cream making this one a lost cause in my book. Some people might like these but I’d much rather have a mint bar from Magnum or Dove. Actually, I’d prefer a mint sandwich from Skinny Cow over this. No Bueno, no Bueno at all. Okay, enough of a rant let’s move onto the World Class Chocolate bar! Okay, the milk chocolate shell is definitely superior. Not only can I identify it as milk chocolate, but it’s far sturdier as well. While the dark chocolate shell cracked in places when I tried cutting it/biting into it, the milk chocolate stayed intact throughout making for a cleaner, more enjoyable eating experience. Also the milk chocolate bars appear to be larger than the first two in size. They all weigh the same so something else is going on here. 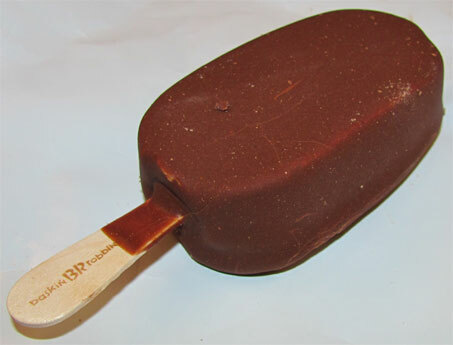 Shockingly enough, I’m also able to distinguish the chocolate shell against the two ice creams inside of the bar. The milk chocolate ice cream isn't much different from the shell taste-wise except that it is a tad bit sweeter. The white chocolate is hands down my favorite out of all the flavors. You get a nice buttery white chocolate that contrasts perfectly with the sweet milk chocolate. That's not the best part of the bar though. The texture is what makes this one for me. Described as milk chocolate and white chocolate mousse ice cream, they weren't kidding on the mousse part. The texture isn't dense like the two dark bars. Instead it's light and fluffy just like a mousse. This would explain the bar looks bigger than the other two with the added air. Now this isn't some fdd texture, you still know its ice cream. It's just the contrast between the crunchy, solid milk chocolate coating and the whipped texture of the ice cream that are addicting. Even for being my third bar, this one was gone in no time. This ranks up there as a favorite novelty for me. Good job, Boardwalk! World Class Chocolate - Amazing contrast in flavor and texture. I can't wait until these and the pints show up in my area. We used to go to BR growing up and it was such a treat. Wonder if the pints will be the same ice cream you get handpacked in the store? 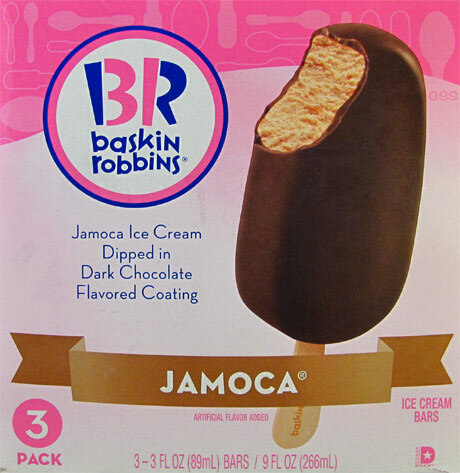 The Jamoca bars sound pretty decent. Just wanted to note that I stopped at Shaws on the way home yesterday and spied all the new products on their shelves, so hopefully you will see them soon too! I tried the B&R Pralines and Cream pint from the grocery store, since it's one of my all time favorites. Hated it! It has a total different mouth feel, airy and cheaper tasting than if you go to B&R and have them handpack it for you out the big brown yummy tub! Spoiled, sorry to hear about your experience. Like I said, it's not the same product as you'd get in the stores due to different type of preparation and manufacturing standards they have to go through. Hopefully since I don't have access to fresh BR, I won't be so disappointed with my container I have in my freezer. Thanks both Dubba and Nick for answering. Happy Easter to both of you and your families! No problem, Anon! Hope you've had a great Easter as well. I totally agree with SpoiledBerners about the texture and flavor of the prepackaged ice cream flavors. I have been eating BR World Class Chocolate for decades and just today I saw that they had it in a prepackaged container. I was so excited since its always cheaper to buy those then the hand packaged kind. Well it was a total let down. Now I know why they are cheaper! Its not as good! I was suspicious with the weight of the container before I even got to the car. Then when I opened it up and tried it I knew from the first bite that it wasn't the same. What a let down! I'm just glad they haven't changed the original recipe or I would have a heart attack! won't know. I will say that it compares to so many other brands of Mint chip. I won't purchase this any more, obviously.